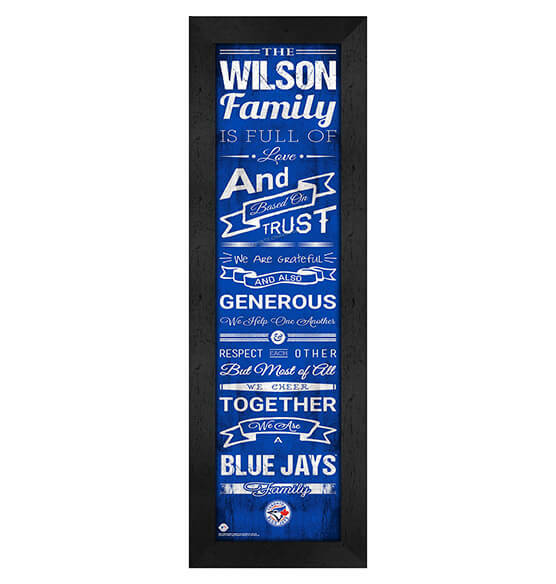 You can pay homage to your favorite MLB team and simultaneously show how much you love your family with our premium-quality Personalized Family Cheer Toronto Blue Jays Wall Art. This stunning MDF vinyl-wrapped, glass-framed piece features sweet family quotes in a vintage-style script. Our vertical-hanging piece comes with an installed sawtooth hanger for easy, drama-free decoration that looks great anywhere in your home. Featuring the Blue Jays' team colors and logo, you'll thrill the die-hard fan when this fine sports decor is given as a gift. Great for holidays, anniversaries, birthdays and more!